On the Low Ropes course you are part of a small group of 5-8 people who have to resolve a number of non-strenuous team challenges and problem-solving activities and, ideally, become a team in the process. hours ago. You don't know what's in store - only that there will be some outdoor activities or 'challenges' to be solved by pulling together. You do know that you need to pull together as a team since the activities are designed so that one person cannot do them alone. The Strong Leader types have a know-it-all approach - winning and being successful is everything. 'Having a go' is not an option - the team must get it right and succeed at the task - even at the cost of relationships within the team. Now, to discourage this tendency, we subtly highlight, earlier in the day, the 'strong leader' phenomenon - and we, slightly less subtly, hint at the value of pulling together for the Low Ropes session to work effectively. But some people don't do subtlety. Or don't hear what they don't want to hear. Or simply haven't got the patience for the team to discover things for themselves and 'as a team'. 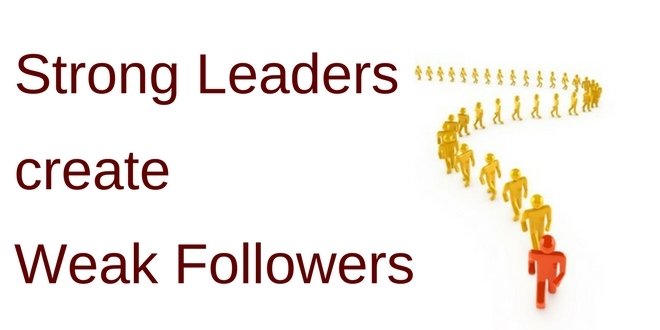 "Strong leaders create weak followers"
I came up with this phrase back in the 90s, when, as a management trainer, I saw this phenomenon in action in workplace teams again and again. And I observed what happened when a Strong Leader type would take over the team... or try to. Acceptance: The rest of the team accept her/him. They now become 'Weak Followers' and do what they are told, with minimal engagement - they emotionally opt out of the team. After all, why bother - Strong Leader doesn't approve of questions or challenges so it's easier to do what you're told and shut up - it makes for a quiet life. Civil war: The team splinters. The Weak Followers are happy to go along with things. But others object and want to be involved as a team. This is resisted by Strong Leader - so they become the Guerilla Group which challenges, resists, and sabotages the Strong Leader. The team is in a state of civil war. Disintegration: Over time, and as they realise Strong Leader isn't budging, members of the Guerilla Group leave for jobs where their skill and experience will be valued and rewarded. Gradually the team becomes one of Weak Followers who are less skilled, have less belief in themselves and are prepared to say in the organisation because they cannot find a better job elsewhere. On our NLP Core Skills course we often explore and highlight this phenomenon during the Low Ropes team challenge session - because it demonstrates in a few minutes what happens in the workplace over months. And and because it demonstrates Tuckman's Team Development Stages of Forming, Storming, Norming and Performing. Before we do the Low Ropes Challenge the group explores the team-working concept that none of us is as smart as all of us. And the empowering Challenge by Choice principle - in which people are encouraged to make their own choices, choices are respected by everyone else on the course. Because of this, and to begin with, most teams are well-intentioned and determined to pull together. And this sometimes lasts all the way through the session. Occasionally the good intentions get forgotten by some. The unfamiliar challenges, the time pressure to complete them, the different communication styles of the team members, plus individual personality traits can result in the would-be team disintegrating into Strong Leader(s) and passive followers... Though only for a while - because, once we observe this in action for a while, we inhibit the Strong Leader Phenomenon by changing the activity 'rules'. Incidentally, a learning point that often evolves in the after-session review is how this phenomenon mirrors what often happens in the workplace. Teams form and bond and have great intentions – and then disintegrate once the pressure to deliver builds up. (1) Okay, just leave this to me! Simply want to speed things up. Now, since the group is new and people have only arrived at the course a few hours previously, most will typically go along with things. But their body language indicates a lack of enthusiasm, ownership and engagement. They have become (temporarily) the weak followers. The team has moved from Tuckman's Forming stage to the Storming stage. So a discussion is held about what needs to change. This usually includes the need for people to listen to one another and to consider all ideas being offered. This is invariably welcomed by all - curiously enough, even by the Strong Leader - and they begin once again, only this time communicating with one another, listening to ideas, and pulling together. Yet, what actually happens is precisely the opposite. The team usually moves into a quite different and very effective phase of functioning - the Performing stage. Now everyone is heard, valued and respected by one another, and all ideas are considered. And if something isn’t working? They quickly switch strategies and experiment with another way. All without a Strong Leader - or Weak Followers. The leadership role now moves around the team depending on who is best suited to it at any stage in their progress. A leader is best when people barely know that he exists, not so good when people obey and acclaim him … when his work is done, his aims fulfilled, they will all say, ‘We did this ourselves'. We began using outdoor activities in our NLP courses back in 1999 because of how these sessions added so much depth to the learning experience. Some activity sessions such as the High Ropes course emphasise and focus on individual performance. Others such as the Low Ropes Challenge course, explore what it is like to pull together as a team. We didn't have this on my Core Skills? Well, occasionally the teams on the Low Ropes don't to go though this Storming stage (the course which ended yesterday 23 July 2017 being just one example). They either bypass the Storming stage or this stage is so low-key and subtle that the issue is quickly managed within the team. Interesting slant on the theme, Liz. And you’re right, of course, it can work in reverse where the reforming manager can be sabotaged by the ruling clique on the ground floor. I’ve actually been in this position, myself, in the past. Subtle game ensues whereby the new manager/leader has to pulse check what is happening, and to/by whom, before begining the reform process. This is where the leadership skills and attitude are truly tested. The sad parts of bad management are the losses. Loss of improvements through taking on board the ideas brought forward by team members and developing them in ways that suit specific situations. Loss of good staff that will find better opportunities elsewhere. Ultimately the result could be collapse, either of a family, a team, business, or government. I would say that new managers (Leaders) coming in to an established team need to be particularly skilled at listening, in order to make it possible for them to be listened to and to be able to motivate team members.